They did it and set a world race record for the pairs. The team set of on 14th December, after a 2 day delay due to weather issues. 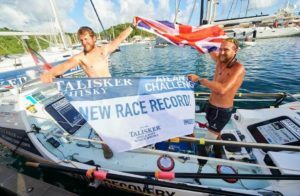 With one Gurkha Officer and one Disabled Veteran (Stepped on an IED in Afghanistan) they are rowing across the Atlantic in the Talisker Whisky Challenge. They are now a week into this challenge which they will not complete until late January. This year twenty teams are taking part. Captain John Armstrong and Lance Corporal Jordan Beecher make up Team Trident. 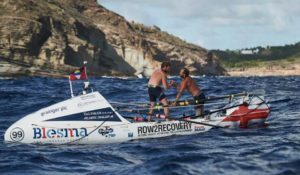 The Challenge is to row nearly 3,000 miles (4,800 km) across the Atlantic Ocean from the La Gomera to Antigua. More people have been into space, or climbed Mount Everest than have rowed the Atlantic. The Row is considered to be one of the toughest endurance challenges on the planet. Team Trident will live in a seven meter boat containing everything they need to survive, the pair will row in continuous two-hour shifts around the clock for between 40 and 90 days. 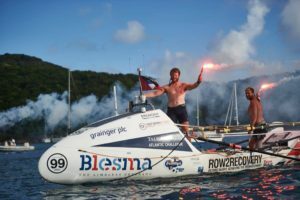 If the row wasn’t enough, the Atlantic Ocean is a fearsome mistress, Jon and Jordan can expect up to 50 knot winds, waves the size of houses, 40 degree heat, sleep deprivation, hallucinations, sea sickness, mental and physical fatigue and will survive off military ration packs for the entire journey. As you can see the team are doing pretty well and 1st in category as at 20th December 2017.